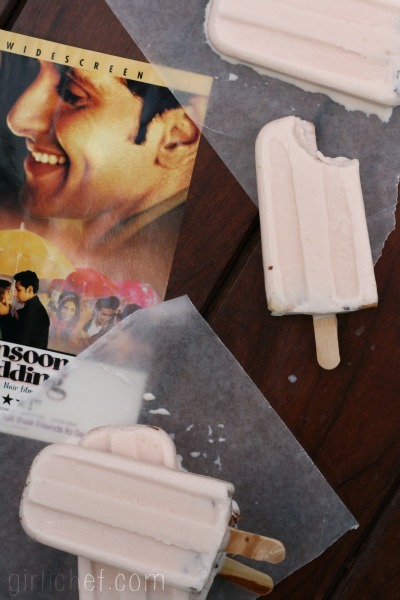 When I chose Monsoon Wedding as our Food 'n Flix pick for this month, I mentioned that though I hadn't seen it in a while (years, really), I remember enjoying it. The sensory experiences stuck in my head - the vibrant colors of India, the music and dancing, the family ties, and of course, the rain. Sitting down to watch it again reminded brought all of the fine details into focus, and reinforced (to me, at least) why I consider this a foodie movie. At just over three minutes in, food already gets a mention...in the form of pakoras. A couple of minutes later, we see Varun learning to make a Coconut Curry. Amidst the family madness surrounding a wedding, and the small love stories developing throughout, offerings of large containers of nuts, bottles of Scotch, jalebis sizzling in oil in the background, ordering a salt lassi or a glass of "the best chai in the world", mentions of cooking sesame chicken, and reaching for a samosa on a high shelf pepper the film. What I really wanted to make was something featuring marigolds, as an ode to the event planner Dubey, and his new wife Alice...who could been seen munching on marigold heads and petals throughout the film. Unfortunately, this is the one year that I didn't plant any. And my back-up sources (my neighbors and our community garden) didn't seem to either. So I had to form a new plan. If you've seen the film, and you know me, you can probably guess where I'm going with this. As a matter of fact, you're probably surprised that I haven't mentioned it yet. That's right, Chuski (aka, ice pops)! We see bride-to-be, Aditi, sneaking away with the excuse of getting a chuski when she and the ladies head into the congested city to pick sari's for the wedding party. She is actually going to make a phone call to the married man she'd been having an affair with, and wasn't quite ready to let go of. But she wind up with a dripping pink chuski that she passed on to Ria...who slurped it in the street, eliciting a catcall of sorts from a male passing by. I mention because I adore the character of Ria, and her response makes me giggle. But the chuski makes a reappearance later on in the film (again with Aditi), but this time eating one side by side with her soon-to-be-husband as they stroll and talk...and she finally comes to her senses and decides to devote herself to the cute, kind, available (well, to her...they are engaged) guy. Yeah, I couldn't resist the ice pops. Did you really think I'd be able to? After I finished to flick to dancing and music and a happy ending, I promptly looked up the word "chuski", just to be sure that it meant ice pop. It does. Sort of. It seems to be more of a general Hindi word meaning "ices" such as ice candy, shaved ice, snow cones, ice pops, and generally...frozen treats to keep you cool under the hot Indian sun. Much like a nieve in Mexico. Again, I really wanted to make one that was flavored and colored by marigolds, but since that wasn't an option right now, I went with another traditional chuski flavoring - rosewater. Rosewater is used to cool and refresh, and I haven't used it in a while. So, rosewater it was. Now, I went the creamy route, which probably isn't very traditional - but it's ridiculously addictive and endlessly tasty...just one lick will leave you wanting more. Whisk everything except the almonds together in a large measuring cup with a spout until thoroughly combined. Starting with just a drop, add enough food coloring to give you a delicate pink tint (if using). 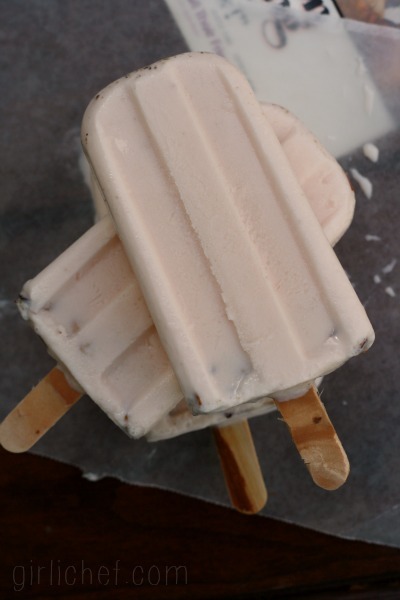 Divide the toasted almonds evenly among your popsicle molds. Pour the mixture into the molds. 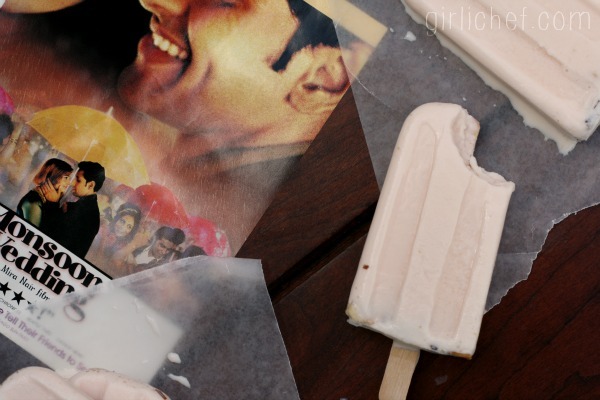 Freeze until solid, at least 4 hours, adding the popsicle sticks in at the correct time for your mold. 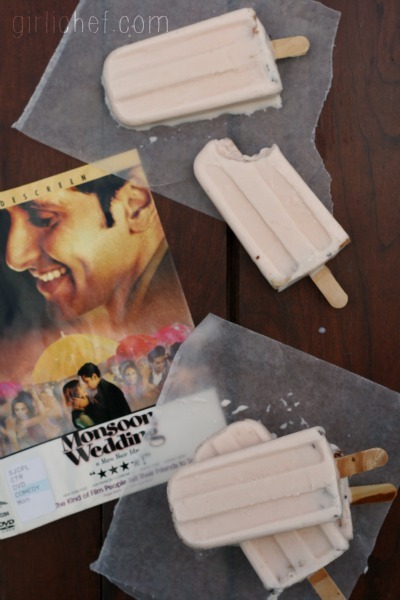 This month's Food 'n Flix pick (hosted by me) was Monsoon Wedding! Today is the last day for submissions, so if you've watched the film and cooked or baked something inspired by it, post it and get it to me by the end of the day. More details here. Join us next month with host Caroline Makes, and her selection, (the classic) When Harry Met Sally!